Seems that I'm in a rut of making banners every month, and this month is no exception. This time, I tried making it in PowerPoint. I'm not sure that I'm totally satisfied with it, but the process was sure easier! Am I the only one that was still trying to do everything in Word? Do people make their cutesy documents in PowerPoint as well? And, I just bought the iFontMaker app, so I'm guessing that next month's projects will be incorporating that! I can't wait! This year, I used my Cricut to help "class up" my gifts. Normally, I stick whatever I can in a gift bag and call it good. Or if I do wrap it, there's no bow or anything. So I decided that this year I would put forth some effort in wrapping presents. I used the same paper for all gifts, and I used red ribbon for one side of my family and white ribbon for the other side of the family. This made it easy to grab presents when it was time to pack up and go! For the tag, I used my Cricut to cut out the first initial of the recipient. Then I used my sticker maker to adhere the letter to the package. I think that they turned out nice! This made-it is actually by my daughter. These were the parent gifts for Christmas this year. I know that I've seen them on Pinterest, but it's sure cute! 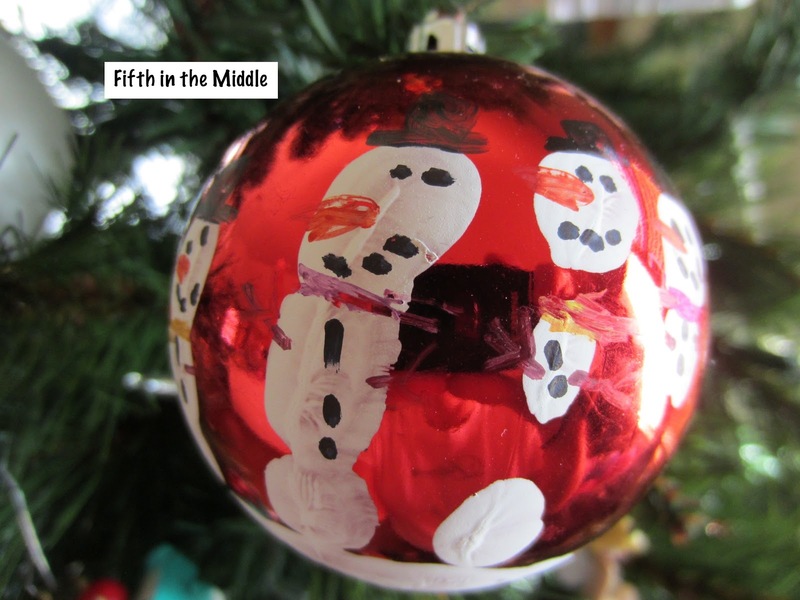 She covered her palm and fingers with white paint, then grasped the bottom of an ornament. Then she decorated the fingers as snowmen. 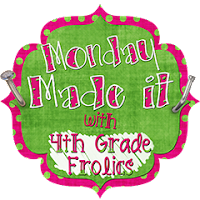 And when you're done here, head over to Fifth Grade Freebies and check out what freebies are currently available! I love your chevron blog design! The banner looks so cute! The ornament is adorbs! I made my son's birthday banner in Powerpoint and LOVED it! I actually just changed it up for a friend, and it took no time at all. I do make all of my documents in Powerpoint, and it's a lot easier. Just stumbled across your blog from the 2013 Year in (P)review linky party. Your blog looks great and has some interesting post to read too! I'm your newest follower...Happy Teaching! Your banner is adorable! I use PowerPoint for EVERYTHING now - I used to use Word like you, but once I figured out how easy it was to use PowerPoint I jumped on the bandwagon. I am super jelly of your cricut ... maybe need to ask the hubs for one for my b-day!